Schedule time on your calendar. Block off at least two or more hours depending on the size of your closet and amount of clothes you own. More time if you haven’t attempted this exercise in the last couple of years. Clear off a large surface (preferably your bed) then take everything out of your closet and place into categories. All pants together, long sleeve tops together, dresses together etc. If your closet is already organized by category skip to step 4. Categorizing your clothes makes it easier to make educated decisions on what needs to go. Maybe you didn’t realize you had five almost identical black pants. Maybe you need to even add a few pieces. Assess the value of each piece of clothing. If you haven’t worn it in the last year there’s a reason why. Be ruthless! We all tend to hold on to items for the wrong reasons. Maybe some of these sound familiar? It was expensive so I can’t let it go yet. (If you’re no longer wearing it, consider consigning it). I’m going to lose weight. (It’s okay to keep a few items in your slimmer size. It’s not okay to keep a whole wardrobe). 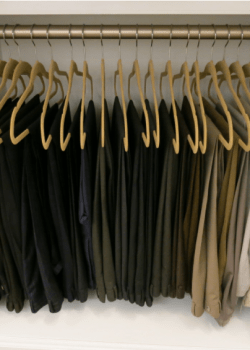 Once you’ve finished editing your clothes, put them back in categories and preferably in color order. We organize by dark to light. (Dark on the left, light on the right). For a professional, aesthetic look we recommend slimline hangers. Guaranteed to transform the look of your closet and put a smile on your face first thing in the morning. Who doesn’t want that? Closet organization is one of our favorite projects!